It is profitable to remember that God has preserved and furthered His church throughout all ages by raising up faithful servants by His grace to teach and proclaim His word. The gospel is not passed on automatically. At no time in history has it been effortlessly passed on to the next generation. In American history in particular, we faced the challenge of maintaining and spreading the gospel even as people moved to new lands without established churches. One man who was instrumental in this effort in our own local area was William Sterling Lacy. 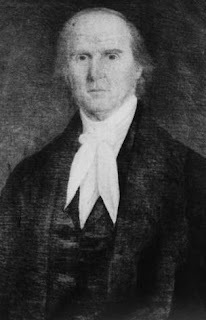 "When Mr. Lacy connected with the Presbytery of Missouri [in 1820], it was as a licentiate of Hanover Presbytery of Virginia, and when he was ordained in 1824, he was the first Presbyterian Minister ever ordained in the State ... His first settlement was in St. Charles County, Mo., where he remained about a year, and he then removed to property he owned in St. Louis County, near the present site of the Maline Creek Church, and here he remained four years, actively engaged in preaching at various places in the county, such as Bonhomme, Cold Water, Bellefontaine, and other places. After this time he again removed to St. Charles County. A few years after he came to Missouri, he was commissioned by the Board of Home Missions to travel a portion of the months of the summer and fall seasons, to preach and to organize churches on the Missouri and Upper Mississippi Rivers, which portions were known as the Boonslick and Salt River sections. He was among the first Presbyterian ministers to visit the counties of Callaway and Boone ... On his return to [St. Charles County], Rev. Lacy took charge of the Dardenne Church, where he remained until 1832, when he removed south to Arkansas. He preached twice a month at Dardenne Church, with the balance of the time spent at Troy in Lincoln County. He was a fine horseman, and he was well mounted. He delighted to ride over the wide prairies in this new and sparsely settled State." "He was a man of striking personal appearance, elegant manners, and fine literary attainments. In his old age he lost his eyesight, but his memory was stored with literary treasures which made him independent of things in print. He could recite from memory the entire New Testament and many of the Psalms and other poetical parts of the Old Testament. He knew much of Shakespeare and Scott and all of Robert Burns by heart." You can read more about Rev. Lacy at this link. He married twice due to the death of his first wife, Sally (who was the niece of Archibald Alexander, the first professor of Princeton Seminary), and he had a total of 17 children. One of them, Rev. Beverly Tucker Lacy, served as chaplain for Stonewall Jackson and his men and afterwards came to Missouri like his father and pastored churches in St. Louis and Mexico, Missouri.